You save about 13% compared to a single order! This is a starter set for your puppy! Puppies need energy-rich foods as well as plenty of high-quality and easily digestible protein so that they can grow and romp about freely. 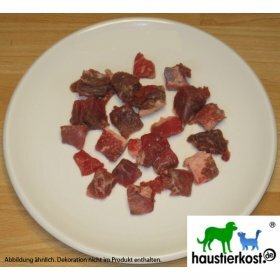 Equally important is the intake of minerals such as calcium for bone development – which is why we include a can of haustierkost.de Puppy Supplement, 500 g . A bottle of haustierkost.de Salmon Oil, 500ml. You can obtain a good overview of the topic of raw feeding with the BARF Booklet for Puppies by Swanie Simon. All products are coarsely minced except for Cat Feast/Puppy Plus, which is finely minced. FEEDING TIP: A puppy's gastrointestinal tract is still quite sensitive, so you should only feed tripe and liver in small portions. Diarrhoea and vomiting may otherwise occur. You can find interesting supplements in the category Vitamins, Oils, etc.